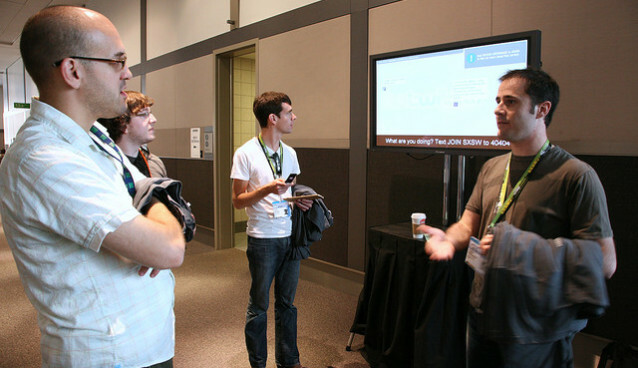 When less than 7,000 of us early-adopters arrived in Austin from all over the world for SXSW Interactive conference in 2007, we were met with Twitter visualization displays in the hallways. These screens cost $11k and were about the only money Twitter ever spent on marketing, as Evan Williams has told. Back then, we didn’t all have our heads buried in our phones like we do these days, and even if we had, one place you want to have your head up is when you’re about to get off an escalator. Thus, one of these screens was positioned at the top of the main escalator. This screen was able to capture your undivided attention for a moment. That moment was all that was needed as new bite-sized “tweets” bubbled up on the screen sharing attendees’ thoughts from a panel they were at, what party they were headed off to, etc. After we all left SXSW that year, we went back to our cities and spread the word about what Twitter was. SXSW allowed us to really “get it” and understand the need for Twitter. What I found very interesting is the mechanism for how content gets distributed through all of Secret. As I understand it, if I were to post a secret, then only my friends (matched from my iPhone’s address book) will see the secret. If a friend likes my secret, then the secret spreads to their friends. If one of those people liked my secret, it would spread to their friends, and so on, until it reaches a certain amount of likes at which point the secret goes viral and everyone potentially sees it in Secret. Despite knowing that my secrets are anonymous and that I could say anything I want, there is a restraint that occurs knowing that only my friends will see my message — at least initially. I try to respect my friends and not say something completely immature or ridiculous. My feed of secrets included humor, “One time I farted in a Pringles can and told my friend to open it”, honesty, “I’m stressed out almost all of the time”, and shocking, “My thoughts of suicide are getting louder.”, which was deemed from “Your circle”. One of my friends has contemplated suicide? Surreal. Granted it’s anonymous and could be a false statement, but in this Secret community it is taken seriously. The comment thread went long, with friends of that person commenting anonymously as well, offering support and open stories. In the past 7 years and seeing thousands of startups, I have only had four really big aha moments: Twitter in 2007, Foursquare in 2009, Turntable.fm in 2011, and now Secret in 2014. My track record isn’t perfect (Turntable.fm just shut down officially after 4 years this week) and we’ll see how Secret plays out, but I’m long on Secret. 1. This post ’11 Thoughts’ is hopefully the first of many more to come. With an endless firehose of opinions, comments, blog posts, articles, tweets, etc., I felt there was a lot of great insight being drowned out. I plan to surface insight that interests me, both new and old. I’ll also be working to extract perspective from some great minds that aren’t very vocal in public print. I’m always looking for great insight, so hit me up on Twitter @popo if you spot any. 2. The flappocalypse is still upon us. Flappy Bird only exists on the devices that downloaded it before the game owner abruptly removed it from the Appstore, but you can have your pick from hundreds of clones, with new ones spiraling out of the ether… every 24 minutes. Dong Nguyen broke his silence last week in a rare interview scooped by Rolling Stone, in which he shares how he thinks of the target audience for his games, “I pictured how people play, one hand holding the train strap.” Dong says he is working on three new games simultaneously and we should be seeing one of them this month. My favorite quote from the article is in Dong asking the reporter if Flappy Bird made them laugh, “The bird is flying along peacefully and all of a sudden you die!”, he said with a chuckle. The only time that game made me laugh was when watching friends be tortured by its’ gameplay. 4. Kids were the way to get onto desktop computers and capture search market share in the form of cleverly disguised toolbars that would set your default search engine and homepage. IAC’s Mindspark focuses on this by running virtual world Zwinky, Webfetti, MyWebFace.com, GirlSense.com, MyFuncards.com, Smiley Central, Cursor Mania, and more. Kids would install these toolbars/extensions (they still do) and typically parents lack the technical savviness to uninstall these toolbars and revert back their default search engine and homepages. I expect we’ll see something similar happen on mobile devices with games and kid-appealing apps acting as trojan horses to capture our attention for promoting other more profitable apps to us. If I install a game and turn notifications on for it, then that developer could notify me of their next app (or of some other app in which they are compensated for promoting to me). As the battle continues for apps hoping to achieve placement on the coveted homescreens of our devices, simply getting on our devices is an achievement. 5. King (the company behind Candy Crush) filed for their IPO recently, it’s always fun to find nuggets from S-1 filings. Thomas BCN uncovers King spent $1M per day on user acquisition and reaped $4M per day in revenue from Candy Crush in 2013. Talk about crushing it. 6. “Whales” is the industry term to describe the big spenders. A new report from Swrve says 0.15% of mobile players account for 50% of mobile games revenue. I wonder if the whales know we call them whales and I really wonder if the whales even realize they are whales, or if they simply think their spending habits are the norm. 7. If you’re looking for an industry to disrupt in the USA, look no further than this telling graph shared by Conrad Hackett (Pew Research). I find it absurd that in the past year at a doctor’s office, I had to remember if I were up-to-date on my tetanus shot or not. I’ll admit to not knowing enough on the digitization of health care, but how my health information isn’t available in a shared digital file for doctors that I give access to, blows my mind. 8. Related: I would gladly share my health records anonymously for collective medical research intelligence. We’re in the first inning of wearable computing — it’ll be amazing once better data related to our health is collected from our phones, tablets, armbands, glasses, rings, clothing, etc. Once this happens, I believe we’ll see drastic reductions in obesity, diabetes, heart attacks, smoking, alcohol consumption, cancer, as well as an increased life expectancy. Collective intelligence will hopefully lead to a cure for cancer and other diseases, as asserted by Nick Denton (Gawker). I imagine someday your glasses will instantly show you a modified restaurant menu with only the items under 600 calories, because that’s all you have left for your daily caloric intake. 9. An observation from Facebook’s acquisition of WhatsApp, Roberto Bonanzinga (Balderton Capital) notes that Blackberry blew it because they could have built $19b of shareholder value with BBM. You know who had the opportunity to have built $19b of shareholder value before everyone else? AOL. They once owned messaging and let it slip away. 11. If you took a screenshot of AOL or Yahoo in 1999, you could mark it up with startups that carved up the product/service/content niches of those portals over the following years. Andrew Parker (Spark Capital) took a screenshot of Craigslist in 2010 and marked it up with the names of startups that were carving up the niches of Craigslist, essentially the “unbundling” of Craigslist. Some of these have grown into huge businesses (AirBNB, Stubhub, Etsy, OKCupid, PoF, HomeAway). Any product/service that began on the desktop and hasn’t yet been able to transition its’ userbase to mobile, is a sitting duck. There is ample opportunity for mobile entrepreneurs to carve up the web — we’re only at the tip of the iceberg. There are 600+ million websites, while only 1 million apps exist in Apple’s Appstore. About the Author: Steve Poland was one of the earliest writers at TechCrunch and is now working to bring asynchronous charades to mobile with his unlaunched startup Act Away (fundraising). Steve has current availability to take on one consulting client. Follow him on Twitter @popo or reach-out steve@vestedventures.com.